Complete health? Activity is only part of the picture. When we talk about “complete health” most of us immediately imagine a hyper-fit, triathlon racing, muscle-bound individual who’s never seen a sick day in her life. But there’s so much more to health than physical health. So the question arises, what does complete health look like? Health and wellness, according to the McKinley Health Center at the University of Illinois, “is a state of optimal well-being that is oriented toward maximizing an individual’s potential. This is a life-long process of moving towards enhancing your physical, intellectual, emotional, social, spiritual, and environmental well-being,” We’re going to take a look at a few of these aspects of health and how they are connected. 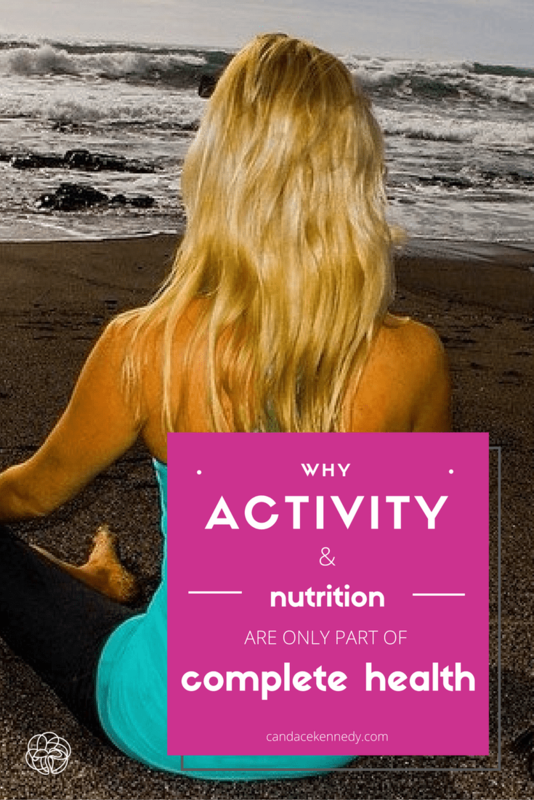 What does is mean to be physically healthy? Your physical health refers to the state of your body and its ability to function the way it should. It is the overall condition of your body. This doesn’t just mean the absence of illness but also includes your body’s ability to perform the activities that it was designed to do, from walking and standing to sleeping and digesting your food properly. As we discussed in the article, Why Your State of Mind is Critical to Your Health, your physical health is so connected to your emotional and mental states. Someone could exercise every day, eat a clean diet but if they don’t have their emotions in check or manage stress well, they are likely not as “healthy” as their outward appearance may suggest. Mental and Emotional Health. Are they the same? You can’t have a conversation about mental health without discussing emotional health, as the two are heavily connected. The idea of mental health is most commonly used when discussing mental illness in that mental health is often used to simply suggest the absence of mental illness. If you are not suffering from mental illness, you are mentally well. Right? Well, sort of. Your emotional health overlaps with your mental health. You could even argue that the terms could be used interchangeably. When you exhibit control over your thoughts and feelings, you are exhibiting mental and emotional health. When you don’t let negative emotions overrun you and have a healthy, yet realistic outlook on life, this could also be a display of both mental and emotional health. According to World Health Organization (WHO) mental health includes “subjective well-being, perceived self-efficacy, autonomy, competence, intergenerational dependence, and self-actualization of one’s intellectual and emotional potential, among others.” That’s a lot of things! Not to mention, the results of the above checklist may change depending on the person and what they might be experiencing in their life in any given time period. All of this can come down to one central theme — how you respond to what life throws at you. In other words, resilience. You may have caught Dan Gilbert’s TED Talk on Synthetic Happiness. If you haven’t, do take the time to watch it. Gilbert defines natural happiness as “when we get what we wanted.” That’s easy. When you’re getting what you want in life, you can’t help but be happy, or at the very least, content. Synthetic happiness, on the other hand is “what we make when we don’t get what we wanted.” That’s the key. How do we respond when we don’t get what we want? Do we wallow in our sadness and think everyone is out to get us? Or, do you find a way to live with what life has handed you and adjust to those circumstances, reframing your situation to either realize or convince yourself that you are better off by, in fact, not getting what you wanted. Research from his laboratory found that “a year after losing the use of their legs, and a year after winning the lotto, lottery winners and paraplegics are equally happy with their lives.” Yes, crazy it seems, but it all goes back to the idea of resilience. Each of us has this quality within us. It takes practice, and there’s no guarantee it will be painless. It’s up to you to tap into it and train your mind to find the good in any situation, or, at the very least, live contently with what has taken place. The better you learn to manage both life’s everyday stresses and the large, trying events the more it will reflect in your overall health. Activity and eating well are, of course, important to your overall health, but it’s important for us not to forget all the other elements that go into complete health and well-being. We’ve focused on a few of those elements today…but what about you? What does complete health mean to you and how are you pursuing it in your daily life? Leave your thoughts in the comments below! This article is a repost from an article I originally wrote for the Spire blog. To learn more about Spire, the first wearable tracker for body and mind, click here.